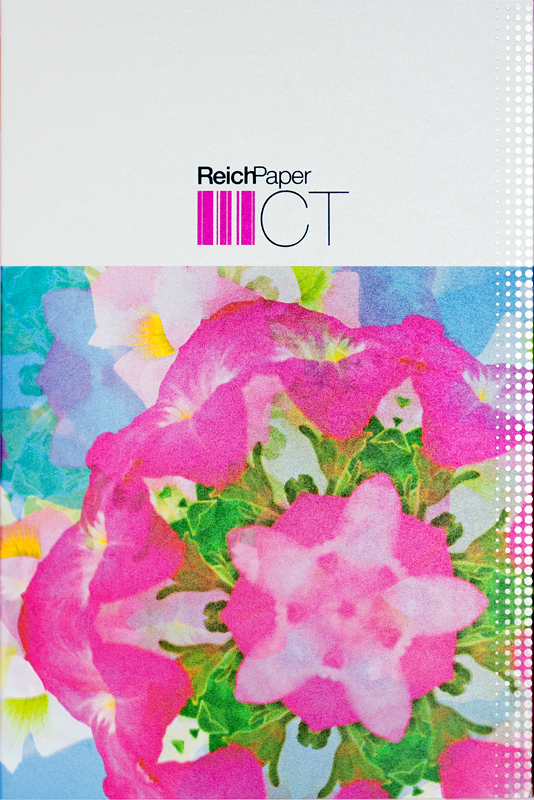 CT is a line of naturally translucent vellum papers unsurpassed in clarity of formation and superior printability. Because its translucency is achieved without the use of chemical additives, CT paper folds easily with crisp clean lines, except for the new CT Clear Cover 105#, which as a pasted stock is not recommended for folding. Through precise fabrication, CT specialty paper is perfect for a range of projects, from specialty food packaging to sleek catalogs to direct mail or corporate collateral. Caliper is a measure of the thickness of a sheet of paper (1 pt. = 1/1000 of an inch). Below is a list of basis weights and corresponding calipers for CT.
All Reich Paper grades are manufactured to a basis-weight standard, not to caliper. Calipers here (and in our stock charts) are provided for reference, but may vary slightly from run to run, as is typical for any paper. If caliper is critical to your project, please contact us to discuss your requirements. Offset: CT’s natural translucency is achieved through super-refining the fibers, which results in an extremely dense sheet and nonporous surface. Conventional printing inks are not suitable for printing on CT. Drying times for translucent papers are longer than for conventional printing papers, and this should be factored in to the production schedule. Heat-Set Web: CT Clear 24#, 30# & 36# basis weights are fully qualified for heat-set web printing, and frequently used for magazine inserts, automobile catalogs, and other large web jobs. Your paper merchant may contact us to inquire about web-roll size parameters, pricing, and delivery. Cold Set Web: CT Clear 17# has been successfully printed Cold Set Web and used as newspaper wraps. CT Clear 17# can easily be folded, creased and stapled. Inks: CT will not absorb ink, so conventional inks must not be used to print on this specialty paper. Use hard-drying, fully-oxidizing inks, as used for printing on plastics and foils. Alternatively, UV-curing inks may be used; these will provide faster drying results than fully-oxidizing inks. Hydroactive drying agents may be added to the ink or fountain solution, as recommended by the ink supplier, but dryers containing wax should not be used where varnish or lamination is subsequently required. Laser: CT is suitable for use in most laser printers, but pretesting is essential, as laser printers differ in the amount of heat generated. As with all papers, performance may vary from one printer to another. While various basis weights may be used successfully, we recommend 24# and 30# for optimum toner adhesion. CT Clear Cover 105# is not recommended for laser printing. Unlike resin-impregnated translucents, our paper will not smoke or melt when laser printed; however, excess heat may cause the sheet to curl. If this occurs, stop printing until machine cools down, or adjust heat setting on laser printer. Ink Jet: CT Clear Ink Jet is designed for multi-color ink jet printing. Most other CT sheets are suitable for single-color ink jet printing (such as text for correspondence and invitations), with the exception of Platinum. As printers vary greatly in how they perform, we recommend you test sample sheets before ordering. Digital: CT Clear Digital HP 30# and 48# are certified for use on HP Indigo digital presses. These papers not only have a special surface enhancement providing for better ink adhesion, they also have a one half inch printed strip on both the leading and trailing edge of the sheet to register with the optical sensors. This strip is intended to be cut off after this paper is printed. CT is also used in other various toner based digital printers. Because digital print technology is changing so rapidly, we invite you to contact us with specific questions and requirements, and to request sample sheets for digital print tests. Alternative Photographic Processes: CT Clear is compatible with alternative photographic processes, and especially for platinum/palladium printing using both developing-up and print-out methods. CT with platinum/palladium is an ideal pairing for archival reasons, and also because the paper renders an almost grain-free image. Grain Direction: Our paper stock charts list all sheet sizes with grain direction last. For all papers, binding and folding parallel to the grain direction is recommended. For natural translucent papers, like CT, it is essential that this recommendation be followed when binding. Natural translucent paper fibers are super-refined; this gives them translucency, but it also means that the fibers are more delicate, and more prone to shrinking and breaking than conventional coated and uncoated papers. In some cases, binding CT against the grain direction may cause curling and rippling of the paper. Folding and binding CT in the long-grain direction will always provide better results. CT Clear Cover 105# is not recommended for folding as it is a pasted sheet. When exposed to dry conditions, all papers will tend to shrink, especially in the cross-grain (short-grain) direction. Where this occurs, the rate of shrinkage tends to be greater for natural translucent papers than for other types of printing papers. Cover Use: If using CT as a cover, to minimize the potential for curl due to changes in atmospheric conditions, it helps to wrap or seal the sheet. Using CT as a wrap-around cover is recommended, as this will stabilize the sheet in the event of changes in temperature or humidity. Line Screen: In general, line screens ranging from 150-200 are used for printing on CT. It is always advisable to consult with your printer to determine the appropriate line screen for your project. UCR: For areas of heavy, layered ink coverage, consider the use of UCR (under color removal) in scanning. This will decrease total ink density, and can cut drying times significantly, especially for black. Storage and Handling: Natural translucent papers are more reactive to atmospheric conditions than conventional printing papers, and take longer to acclimate to changes in temperature and humidity. Store unopened in the pressroom, in the original packaging, for a minimum of 24 hours prior to use—longer if previously stored in cold conditions. Store away from vents and open doors where exposure to uncontrolled humidity or excessive heat or cold could occur. Never leave CT uncovered; the paper should remain wrapped or covered with plastic at all stages of printing and finishing. For best results, pressroom conditions should be as close to ideal as possible: RH of 45-65%, Temperature 63-73° F.
Feeding through Press: To ensure uniform feeding, we recommend sheets be well aired during loading. Rack in small piles. We suggest a maximum of 250 sheets. If magic eye tripping out problems occur during feeding, adjust the photoreceptor to a finer sensitivity if possible. If unable to adjust to a fine-enough setting, particularly on the printing end, try taping one or two pieces of translucent stock over the eye to give enough opacity for sheets to register. Dampening Solution: The ink/water solution should be run at an absolute minimum. Excess water will not be absorbed or removed from the blanket; this will slow drying time and may affect the dimensional stability of the sheet. The fountain solution should be compatible with the inks according to manufacturers’ recommendations. Spray Powder: Use a coated spray powder of normal fineness of less than 1 mil; avoid varnishing powder. Cure in small lifts. Some airing of the stack will be beneficial for ink drying. Pretesting of all finishing operations is recommended. After printing, leave undisturbed for at least 24 hours to prevent offsetting. The finishing environment should be the same as the pressroom; if not, allow the paper time to acclimate to new conditions. The paper must remain wrapped or covered between all stages of the finishing process. Varnish and Coating: As for all papers, varnishing CT after printing can help to protect the printed area, especially for projects where finishing is complex. However, since the recommended inks for printing on CT dry hard, they already produce a relatively scuff-resistant surface. Aqueous coatings are not suitable for use on CT, as excess water will cause the sheet to curl. Embossing: Embossing CT colors will lighten the embossed area. For CT Clear, the embossed area will appear to whiten somewhat. To minimize the potential for cracking, avoid using very sharp tools. Foil Stamping: When foil stamping on CT, please be aware that large solid areas of foil may be more problematic than smaller areas, because of CT’s relatively dense, hard surface. The success of foil stamping on any substrate depends on pretesting. The printer should consult a foil-stamp supplier, and pretest on the actual stock to be used, as a wide range of variables (types of foils, complexity of the design, pressure, environment, etc.) all determine the success of foil stamping on any stock. The first step is to decide what sort of foil effect you want, in terms of color and finish. By showing the foil supplier a sample of the substrate you wish to use, and the foil coverage you hope to achieve, he should be able to determine the best foil and release to use. Then, the printer and foil supplier should identify the correct release, thickness, and pressure to ensure that the foil will work well on the specified substrate. An essential part of this process is pretesting on the actual stock to be used. A foil that works on one paper is not necessarily going to work on a different type—nor should it be expected to do so. Likewise, a lightweight stock may require an easier release than a heavier weight of the same paper. Thermography: As with all printing and finishing applications, you should consult with your printer and pretest as necessary. Because this is a dense, hard stock, there is some potential for thermography to smear. If this occurs, slipsheeting at the end of the press is one possible solution. Scoring & Folding: CT Bond basis weights are natural translucent papers, and thus are fully suited for most folding applications. CT Clear Cover 105# is not recommended for folding as it is a pasted sheet. As with all papers, a fold parallel to the grain is always preferred. This is especially important as basis weights increase: for weights in excess of 30#, a fold parallel to the grain is recommended, as is a rounded channel score with a minimum width of 2.5 times the caliper of the sheet. Take extra care when folding in low-humidity conditions, or where the paper may have lost moisture during an earlier process. Binding: Binding should always run parallel to the grain direction. (For extensive information on the importance of grain direction in binding, please refer to our Paper Terms. Except for CT Clear Cover 105#, CT may be saddle-stitched and even sewn without a problem (unlike the more brittle resin-impregnated translucents, which tend to crack when folded and stapled). For Perfect Binding, a variety of glues may be used successfully, but aqueous-based adhesives must be applied sparingly. Hot-melt glues are preferred. Trimming & Cutting: Cut in small stacks; a two-inch maximum thickness is recommended. Likewise, for Die Cutting, a dull blade is recommended, and paper to be die-cut should be put up in small stacks. CT envelopes are wonderfully eye-catching, and boast higher-than-average response rates when used for direct mail. As with any envelope, it is essential that the size of the insert be appropriate for the envelope, and that the contents not be too thick, which could cause problems as it passes through automated postal machinery. CT envelopes will work beautifully with single-panel and folded cards, but should not be used for multiple folded pieces, booklets or catalogs. For every standard envelope size, there is a corresponding enclosure size that is recommended. Please be sure that your insert is neither too large (generally an insert should be ½” – ¼” smaller than the envelope, both in its width and its height), nor too small (an insert that is undersize may move around too much within the envelope, and thus cause seams to give way). We recommend conducting a test mailing to ensure that the envelope and contents are compatible in terms of size and bulk. Sample envelopes are available for that purpose. All CT Clear (except CT Clear Cover 105#, CT Clear Digital HP and CT Clear Ink Jet) are FDA approved for direct food contact. The entire CT product line is naturally oil and grease resistant. Please contact us if you have any questions about the Printing and Use information included here, or need information about any other topics. We have endeavored to address most aspects of printing and use here; however we do not accept liability for any errors or omissions. Should you have any questions, or need any additional information, please contact us using the following form HERE.